Duke’s Model 1896 Krags — At front is the infantry rifle, at the rear is a cavalry carbine. Here’s how it went: A rather attractive lady was introduced to me at a gun show. Her recently deceased father had left her three fine cavalry carbines: a Plains Indian Wars era Spencer, a U.S. Model 1868 Sharps and a ’96 Krag. All were original — nothing jacked-up by erstwhile gun plumbers. She wanted to sell them so I told her what I thought were fair prices and identified some potential buyers at the show who might be interested. And so I climbed another step up the ladder toward sainthood. Well, kind of. At any rate, I came home with a fine addition to my collection. All U.S. Krag versions had a box magazine opening on the right side of the receiver. Cartridges were pushed beneath the bolt raceway and fed into the chamber from the left side. Historically, Krags are mere footnotes to American military arms, serving only from 1892 to 1903. None actually got into the troops’ hands until 1894 and were withdrawn starting in 1907. The Krags did participate in the Spanish-American War, the Philippine Insurrection and in China’s Boxer Rebellion. None of those wars compared with later 20th Century conflicts, but they were plenty intense. Compared to the prior rifles and carbines that served — or the ones adopted afterwards — the Krag was a strange beast. Before the Krag, U.S. Model 1873 .45-70 “Trapdoor” Springfields were black powder cartridge single shots with a breechblock that pivoted upwards to eject the empty case and expose the chamber for reloading. After the Krag came the Mauser-style U.S. Model 1903 Springfield .30, a turnbolt fed by pressing five rounds from a stripper clip into an integral box magazine and using a hotter rimless cartridge. Infantry evolution: The U.S. Krag (Model 1896) sits between the .45-70 Model 1873 Trapdoor on top and the U.S. Model 1903 .30-06 on the bottom. Long or short? The U.S. Model 1896 .30 Gov’t infantry rifle (top) featured a 30" barrel while the 1896 .30 Gov’t cavalry carbine (bottom) had a 22" barrel. When the U.S. Army’s Ordnance Department put out word they were seeking designs for a magazine-fed repeating rifle using smokeless powder cartridges, Col. Ole Krag and Mr. Erik Jorgensen of Norway submitted a sample. A total of 53 models from around the world competed in stringent testing, and by 1892 the Krag-Jorgensen submission was chosen. Basic infantry Krags — of which there were Models 1892, 1896 and 1898 — had 30" barrels with blade front sights, coupled with open ladder type rears graduated (on the ’96 models) from 700 to 1,800 yards. Basic Krag cavalry carbines had 22" barrels and the same type open sights (on ’96 versions) but graduated from 700 to 2,000 yards. Carbines were made in Models 1892 (only a couple of prototypes), 1896, 1898 and 1899. An unaltered Model 1896 carbine is immediately evident by the raised hump on the barrel band put there to protect the rear sight. All Krags had straight bolt handles and magazine cut-off devices. The cut-off’s function was to stop the magazine from feeding so that single rounds could be dropped in. Why? Remember, when the Krags were being adopted, many army officers were veterans of the Plains Indian Wars and many senior ones were Civil War veterans. They had lived and fought with single shots. Krags are famously good-shooting rifles. The Springfield Armory where they were built manufactured Krags to a cosmetic and functional quality level equaling or surpassing contemporary American production firearms. When my eyes were younger I could put five rounds at 100 yards into less than 2 MOA from my ’96 rifle. That was with my own cast and jacketed bullet handloads. The ’96 carbine came after my senior citizen years so I’ve never gotten better than about 3 MOA from it. After a little experimenting I settled on the 220-gr. Sierra or Hornady .308 RN bullet over 40 grains of Hodgdon’s 4350 for a velocity of just over 2,000 fps from the rifle’s 30" barrel. One last interesting bit of Krag trivia: its .30-caliber cartridge, once called the .30 Gov’t, is now referred to as the .30-40 Krag. And I almost forgot! My ’96 Krags are just as smooth-functioning and slick cycling as the old timers used to claim. 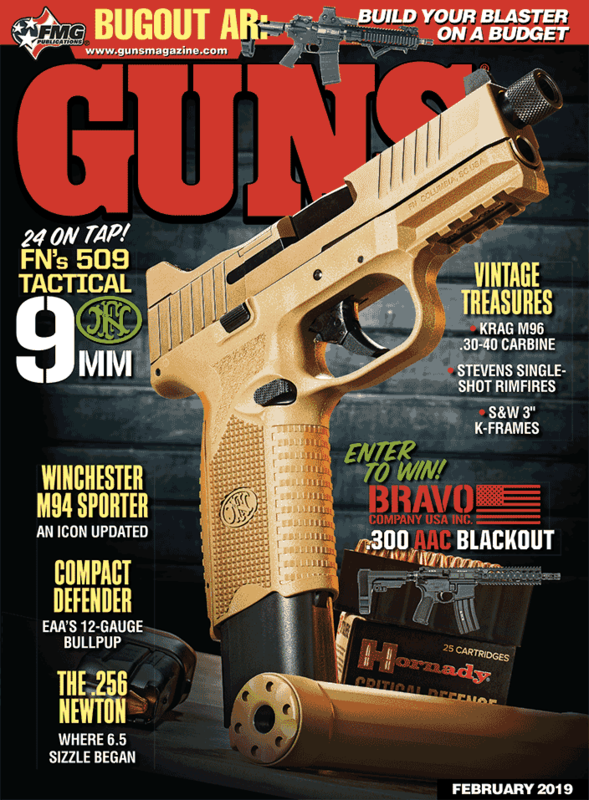 Purchase A PDF Download Of The GUNS Magazine February 2019 Issue Now! Prize package includes: Walther PPQ SC LE pistol, Emerson La Griffe knife, Wiley X glasses and one-year membership to Armed Citizens' Legal Defense Network.